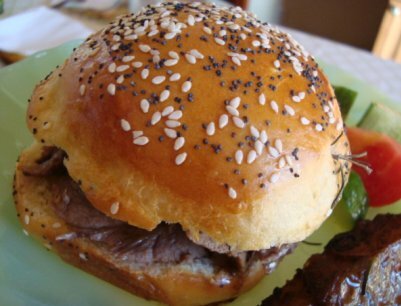 Nice recipe for some one day buns for sandwiches, hot dogs, or burgers. Adapted from a Beth Hensperger recipe. I had just written out the recipe with instructions and deleted the whole thing ; / So here goes again! 15 oz. Bread Flour with extra to adjust hydration if needed. I used Gold Medal Bread Flour on sale here for less than 2 bucks a 5 lb. bag. Sesame and Poppy seeds, springs of fresh Rosemary. Add liquid ingredients to KA Mixer, add dry ingredients, I sift my flour and dry milk powder together. The KA Dry Milk Powder tends to be sticky and can clump together and become hard if left with moisture for to long..so I just always sift it with my flour..using a wisk or a wire scoop. Mixed until shaggy adding more flour as needed to adjust hydration. Cover and rest 25 minutes. Knead until gluten formation just begins. Stretch and folds 30 minutes apart until gluten has formed nice windowpane. Pour out onto counter, shape even weighed rolls, I made 8. Place on parchment lined pan and press down to shape buns. I pressed a biscuit cutter nearly all the way through just for a little extra pattern on rolls. Let rise till nearly double. Glaze and sprinkle on seeds. Baked 350F in a convection oven setting till nicely browned..about 20-25 minutes. The pattern from the biscuit cutter was not very pronouned.. Very nice, Sylvia. Do you mind if I link to this from the homepage? It's nice to come upon a recipe that produces a good same day product! Sometimes you just want to make a sandwich (like yours above) without it taking two days. That was just what I needed some for dinner and none in the freezer! These are just beautiful Sylvia. The rosemary is a nice touch. Thank you for sharing. I made some hamburger buns from a recipe last week, not badl, but I think they needed eggs. Yours are beautiful. What did you glaze them with? I'll be making them soon, although I can't promise I won't be converting it to at least half whole wheat, LOL!! Thanks so much for sharing your beautiful pictures. This recipe will do great with some whole wheat. The dough can be sticky, tacky so watch your hydration..probably will need some extra flour...even though ww absorbs more water. The eggs, butter and potato make for nice rich tasting buns. Using egg yolk and milk will give you a nice golden glaze. I used 1 egg yolk,2 TBsp. milk and 1-2TBsp water...just yolk and milk is also very nice for glazing. I'll try with soy milk and some whole wheat. Most of the time my flour soaks up water like a sponge if I give it time. I'd be surprised if it needs more flour. I'm curious to see how the potato flakes work with the WW. I bet the results are stunning. You can use flakes or fresh mashed potatoes. I really enjoy using potato in recipes because of the nice added moisture and tender texture it adds to the crumb. Wow! They're awesome Sylvia! I think I might have to give these a try! These were fun experimenting with the shapes by pushing a biscuit cutter into the dough..the farther you push you get some very pretty shapes along with a rich flavor..I made another batch with dried tomatoes placed in the cuts that went all the way through that look like little hats with feather's..I found out the dried tomato strip needs to be placed on the inside of the rows to keep from becoming to browned. Those look mouthwateringly good by themselves...not sure I would spoil them by adding anything else. ...bread bakers have better buns. And Congratulations making the centerfold! so funny! Just goes to show you..your never to old to have a bun in the oven! Another good looking Aussie and i was beginning to think i was the only one,although i would have to admit yours are probably a whole lot more desirable. Well it looked very happy there and being very close to lunch time here i.m feeling rather hungry. Is Australian lamb expensive there? it is quite dear here, leg of lamb about A$8.99 a kilo, i am very partial to chops and rack of lamb. price here unless you catch a sale and that's not very often. Nothing like lamb chops or a delicious rack of lamb! A lady here sells her fresh butchered spring lamb at our local farmers market and it's very dear and sells out right away..you know it's well cared for and very delicious. I have been unable to focus on baking over the last couple weeks but today I could resist no longer. I whipped up a batch of your seeded buns. They were absolutely delicious. I even had a few sprigs of rosemary in the cooler I managed to salvage for the event. Yours look better than mine but I wasn't able to eat yours lol. I'm so glad you enjoyed the buns. They are handy and so tasty...and fill that need to bake right now craving pretty good but short lived, I'm afraid ;) We really love the little buggers. Had them for pastrami sandwiches the other day. We've been living on a batch I had frozen. I haven't had time to focus on any serious baking either. I can't even manage to make some pizza dough. We've been doing projects on the yard landscape and the backyard rusted iron fence is being replaced and we painted the wood side fence, my frig leaked all over..the good part about that is I will now have it for an extra one in the garage and a new replacement. Looking forward to my son, daughter-in-law and grand-daughter coming next week for a little stay. Oh yes, a new chair and bread books for me and my dogs.. : ) and back to baking...soon I hope. Couldn't stand to look at the pictures anymore! Everytime I go to TFL's homepage, those beautiful sandwich buns have been staring at me. Finally broke down and baked your recipe. See below. Oh they are wonderful! And dinner is right around the corner! Thanks for sharing such an easy but tasty recipe! Thanks for posting that receipe. I made a batch last weekend and they turned out exactly like in your pics. The taste is awesome. My husband loves them. We are living in Germany and over here it's kinda difficult to get some 'American-style Sandwich Bread'. We use to be able to buy it on base but ever since he got out he's been craving something like that. I couldn't bake them Saturday night, I started a little to late and then didn't want to stay up till midnight, just to bake some buns. So I stuck 'em in the fridge and baked them in the morning. We also tried them as Burger buns and that worked just great. Next time, I'll try to make 'em with some dried onion and see how that turns out. Thanks again for posting that awesome receipe! I'm glad the recipe worked for you and you enjoyed the flavor. They are great for the all around burger. Adding some dried hydrated onions sounds delicious. Sylvia these look FANTASTIC! I saw you answered on my question regarding powdered milk and it was actually this recipe I wanted to try, do you think it would be ok with regular milk? I might get some powdered milk and try it both ways just to see the difference. I had another question, why do you press them with the biscut cutter? They are so lovely I can't wait to try them. Thank you so much for posting!!! Hi Shannon, Thank you for the very nice compliment! You can replace the water with milk and leave out the powered milk. I can taste a difference when using either milk or powered milk. Both flavors are very nice and just a matter of preferance. I use the powered milk from King Arthur flours that is special formulated for baking..it does not reconstitute into liquid milk like the powered milk you buy at the grocery. I have also used powered milk from the grocery and all work fine. When I use regular milk in my baking I warm just to a scorch..that's just before it begins to bubble and let it cool before using. You might like to refer to some discussion on this subject here in an earlier post. Would it be ok to omit the milk powder? Maybe try replacing powder and water with soymilk. I often do this substitution in other recipes with great results! Is the milk used to tenderize the crumb? Great looking buns, Sylvia. Are they sturdy enough to hold up to a juicy burger with veggies? I hope so, they look gorgeous and tender too. I've made the same recipe I've used forever.. My grandmother used to bake them for the kids at summer camp in Montana. But, I think I'll try yours with the potato and egg addition. It could be just the thing we're looking for. Thanks for sharing! Thank you, BellesAZ! 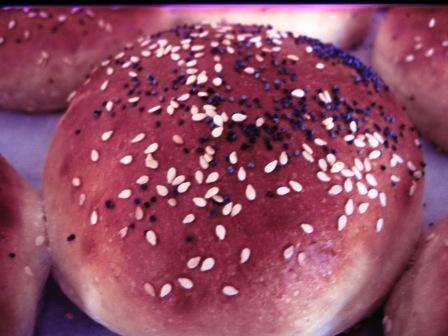 These buns are great under a juicy burger with veggies...we love them toasty grilled on our burgers. Took a day off to bake & made up a batch of your buns, my family is still raving about them this morning. It was a challenge to make freinds with the dough untill I treated it like little 4 oz. ciabattas. 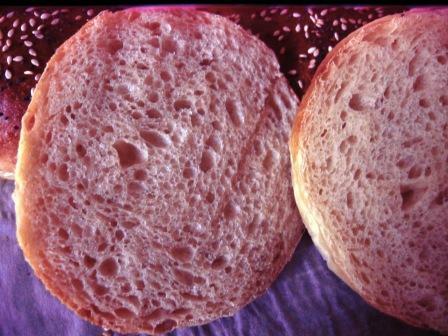 The results were great & I have a new confidence in sandwich bread thanks to you. Hi Sylvia, thinking about making your recipe today and had a quick question. You have your 350 temp set for a convection oven. What would you recommend for a standard oven - I have gas. I'll be moving soon and hubby and I just bought a convection/double oven - and I cannot wait! But for now, I need to figure out what you would do here. Just bake until internal temp is 200 degrees? My convection oven cooks faster and hotter than my regular oven settings. My convection setting will bake about 25 degrees hotter. Be sure and read all your directions. There are different operating types of convection ovens. I don't have experience baking in a gas oven any more than just a few times. When baking breads I turn the fan off for the first few minutes of steaming...the circulating air can dry the top faster and turning the fan off helps to bread to rise without setting the crust to fast. You will just love your convection ovens. I hardly ever use my bottom non-convection oven. Making buns or small rolls you want to bake with a hotter oven, 375 to 400F...depending on your oven. These look great and just what I need for dinner later tonight. Middle son is coming to eat some pork tenderloin and he loves the gravy I make with it so he's always looking for a roll to dip into it, this looks perfect for him. Thanks Mattie, These would make attractive and delicious dinner rolls for dipping into your pork gravy. You might even try making them smaller for dinner rolls by rounding each piece up into a ball without pressing it down and placing them into a pan suited for rolls, glaze and sprinkle on seeds add a sprig or sprinkly of rosemary/ fresh sage leaf for garnish. Rosemary can also be added in the dough. This recipie realy works good. I shaped the dough into cloverleaf rolls, baked them in muffin tins & submitted 8 of them into the Wood county Ohio fair. 1st place ribbon, thanks again for posting this! I was a teenager the last time I paticipated in the fair. My potato bread got a 3rd place ribbon also. Baking bread is great fun. a first place ribbon, Congratulations : ) ... I ran out and told my husband and e-mailed my daughter. I would love to see a photo of your rolls if possible. These would definitely take the prize at a fair! They are just beautiful, would love to see the recipe in a clover leaf configuration. I've got 3 entries planned for our state fair in Phoenix. I have to come up with a cake, a yeasted item and something with C&H Sugar. I might pass on the sugar entry, but cake and yeasted item here I come! Other's are experienced at fair entries and can give better advice than I can...I have never entered a fair contest other than a school fair contest for best poster drawing...that was a very long time ago 5th grade. I was thrilled my simple small poster with stick people on their way to the fair won over some hugh elaborate ones...I'd say keep your bakes simple, pretty, with that element of surprise and very tasty. LOL, I bet that was something! before I could get a picture & What I thought would be on display at the fair was auctioned at the baked goods sale for a fund raiser a few hours after judging. So now I'll just have to suffer & bake some more for a picture.